Olive Leaf Extract…it is a MRSA killer! Olive leaves have been used for medicinal purposes for thousands of years and as such, it comes as no surprise that Olive Leaf Extract is an effective treatment for various illnesses, diseases, and infections. Recent research has shown that its antioxidants have been effective in treating some tumors and cancers such as liver, prostrate, colon, skin, and breast cancer. So where do the healing properties of Olive leaf extract come from? The active ingredient that is primarily responsible for the medicinal and health benefits of Olive leaf extract, is Oleuropein. How could it possibly be effective against something as “dangerous” as Aids? It is believed that the reason Olive leaf extract has proved so effective, even against viruses such as HIV, is its ability to inhibit the production of the enzymes, reverse transcriptase and protease, both of which are necessary for viruses such as HIV to damage healthy cells. Scientists believe that this is why there are several reports of Olive leaf extract being successfully used to treat HIV/AIDS sufferers (in conjunction with other medications). To save you some time though, below is a link to one report of Olive Leaf Extract that was published in the Scholars Research Library. In the research, Olive Leaf Extract he studied the effectiveness of Allicin against Staphylococcus Aureus and it WAS found to be effective. You can click here to read that report. Olive leaf extract is extremely safe and is considered to be non-toxic even at high dosage. There are a few side effects to the use of Olive leaf extract however; they are generally the result of Jarisch-Herxheimer reaction, aka the “Hex” reaction or the “die off” effect. Essentially, when you begin taking Olive leaf extract, it kills the pathogens that are causing the disease, illness, or infection. As these pathogens die, they release toxins which if not flushed from your system immediately, are “stored” in the tissues surrounding the infection site until such time as they can be removed from the body. This usually leaves redness and possibly also some slight swelling. This “die off” effect is really a good sign. It means that the Olive leaf is effectively killing the pathogens and you will soon be on the road to recovery. These “side effects”, when they do occur, normally last only for a few days and are generally mild. Also, as I said earlier, these “side effects” are not a reaction to the Olive leaf extract per sae, but rather a reaction to the death of the pathogens in your body (the “die off” effect). If the infection being treated is severe, the side-effects may be worse and last longer and a reduction in dosage may be necessary to reduce discomfort. If required, treatment can also be temporarily suspended to allow the body to deal with the overload more easily, and then resumed at a lower dosage to keep the die-off effect at a manageable level. As I said earlier these “side effects” are not so much a reaction to the Olive leaf extract but a reaction to the death of the pathogens in your body which is a good sign. Where can you get Olive Leaf Extract? Most health stores offer several brands of Olive Leaf Extract in either capsule or liquid forms. As with most supplements, you can also purchase Olive Leaf Extract online from places such as Amazon, often at a cheaper price. Buyer beware…not all Olive Leaf Extract is made equal. There are brands out there that make various claims about the level of Oleuropein in their product and in some cases, these claims have been proven to be false. For this reason, I will only recommend Comvita Olive Leaf Extract. This is because it is the only brand of Olive Leaf Extract that I used during my battle with MRSA and I know that it was effective. 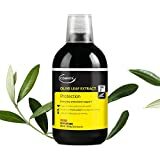 Do I recommend Olive Leaf Extract? This is because not only is it effective against MRSA, but it is a great supplement for daily use due to its other known health benefits. Will olive leaf also kill marcons staph in the nasal passages? And mold in body ? I used Olive leaf topically (on the skin) and took it orally in capsule form for the gut. For the nasal passages you really need some Allicin gel or do olive leaf inhalations. At the end of the day, eating the right diet is crucial to treating the CAUSE!!! You can then, supplement the diet with topical and internal treatments to treat the SYMPTOMS. Hi…in short, no I can’t. I am not a medical professional. I have heard that there are/have been some experiments regarding the use of Olive Leaf for people with HIV/AIDS so perhaps you should speak to a medical professional about the results and your options going forward.